No ‘Dutch Open’ this year …. No, don’t worry. There will be an event in Sneek this year (Oct 9,10,11,12). It just will not be called ‘The Dutch Open’. What is missing is a good name for the event. What started as a ‘simple’ lockpick championship turned out now into a multiple day conference that also happens to hosts the championships. More about that on the bottom of this post. And we are not ready to release a full detailed program for the Dutch Open. The rough outlines are there, but the fine details are missing. I am very proud of the people that will give a presentation at the event in Sneek this year. Just like last year, Peter Field will kick off the open with a 4 or 5 hour presentation about various locking mechanisms from around the world. And to clarify: Peter started off last year by saying he was here to talk about locks, not how to bypass them. It is very clear that he learns from us how we think we can bypass certain techniques, yet will not talk about vulnerabilities he might know off. Another heavyweight presentation will be that of Marc Tobias and Tobias Bluzmanis. They will explain in detail how they cracked the Medeco codebook and how to pick and bump some of the locks. For this purpose Han and I managed to purchase a collection of Medeco bi-axial locks and keys, and even have a special key cutter that can cut angled cuts. In other words: enough material to see if the Tobias hacks really work will be available. Besides Peter and the two Tobiases, Matt Fiddler, Mike van der Stelt, Jord Knaap, Paul Crouwel, St.john Goldfinger, Nigel Tolley, Michael Huebler and hopefully handcuff wizard ‘Ray’ will give presentations. Besides the missing name for the conference we are not sure how to organize a ‘safe combination lock contest’. Giving every attendee a different lock and having them all open it at the same time sounds a little unfair. As no two locks are alike, it will be a matter of chance who has got the lock that marks easiest. On the other hand, having one or two combo locks available for people to try upon will cause people to have to wait a long time before they can compete. And once someone successfully opened the lock, he could (in theory!) tell a friend and have him open it in ‘an amazing time’. Or you can change the combination of the lock after a successful opening, but that will also cause it to be more or less difficult as the previous combination (as no two combinations are equally difficult on a lock). If people have ideas about how to solve this in a fair matter, or have experience in this kind of game, I am very interested to learn from them. Of course there will be a classical Dutch Open lockpick championship as well as an impression championship. If you prefer one of the above, or (even better) think you can come up with something more suitable, we would love to hear from you (in the comments). So … back from Las Vegas and still not fully recovered from it. The heat is overwhelming there, and recovering two jetlags in a couple of weeks is taking it’s toll. But nevertheless we had an extremely good time and learned to know a lot of people. Besides the people I already knew, the people from ‘Fool’ pleasantly surprised me. Very friendly, very knowledgeable, and most important: they seem to have ‘the drive’. Hopefully they will make it to the Dutch Open in Sneek this year. We are currently very busy planning the Open, and next week’s posting will be a long one informing you about it. As always my suitcases were loaded to their limit when coming back. Got a lot of tools and gadgets, and a lot new blanks for my collection. But what is more important is that I now got a device to create my own blanks! I took advantage of the low dollar and purchased a ‘keyway king‘. 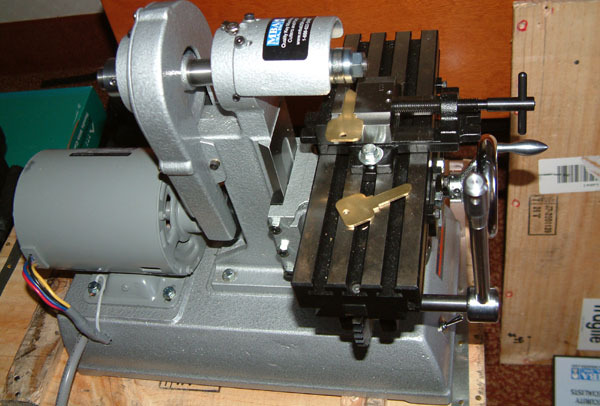 It is a horizontal milling machine that comes with 16 different cutting wheels. 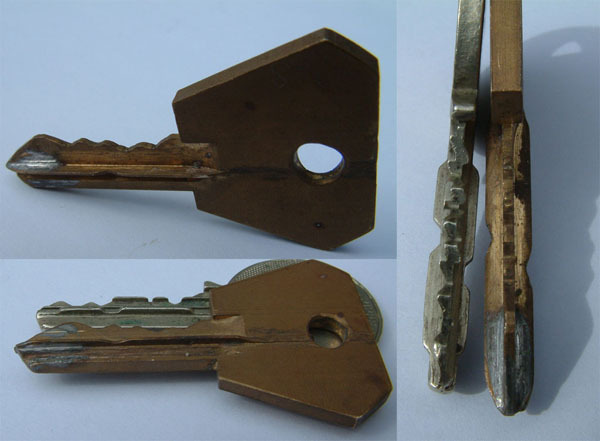 The idea is you measure the cuts in an existing key or keyway and then try to reproduce them on an uncut key (a true blank with no grooves in it). It is also an ideal machine to cut grooves in existing blanks as some manufacturers only use a few ‘basic blanks’ and just take away some grooves to make them fit one specific profile. Now packed my bags for a few day’s Berlin. At least I will be in the same timezone now …. I must say Defcon is not like any other conference I have ever been to. Not necessarily better or worse then other conferences, but different for sure. And if you ask what is different … I leave that to your imagination. No time to write more, but I do make the promise to follow up and write some serious postings in the weeks to come … Back to the party now …. Entries (RSS) and Comments (RSS). 43 queries. 0.338 seconds.